This is a slight variation on the traditional hummus, I’m using butter beans instead of chick peas. The roasted vegetables add a fabulous flavour. 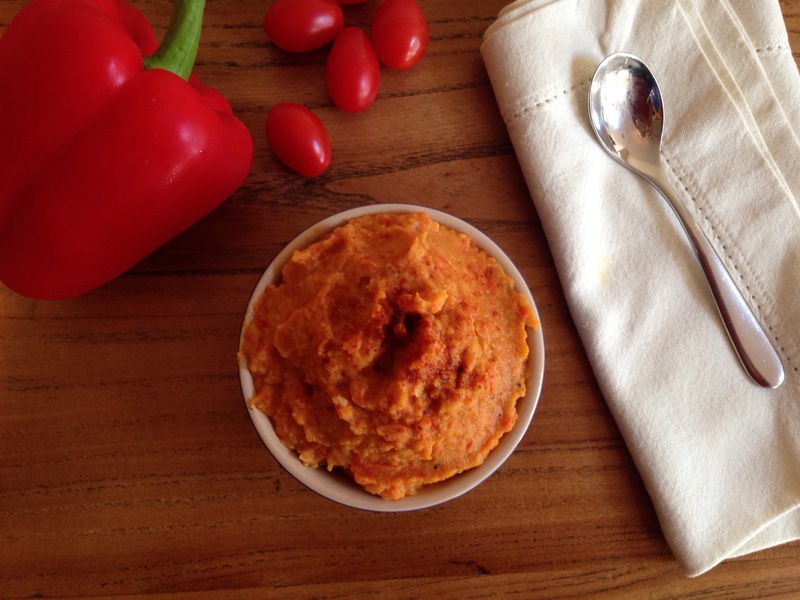 Smother this on bread for a filling lunch or it is the perfect dip with raw vegetables. It’s a great nourishing quick lunch while you’re on the go. I often make a couple portions ahead of a busy week to have it waiting for me in the fridge. Pre heat your oven to 170C. Wash, de seed and slice the pepper into eights. Place the sliced pepper and tomatoes on a baking tray and roast for 30 minutes approx until the vegetables are soft. Meanwhile rinse the butter beans well under running water then add to a food processor. Once the roasted vegetables are ready place them along with all the remaining ingredients into the food processor. Blend until smooth. Add more lemon or oil as needed if consistency is too thick. Scoop into a large bowl and enjoy with crusty sourdough bread. Delicious. I really like the look of the humous, I bet dad would never throw it out if he found it in his fridge… Hee Hee. That Himalayan Salt sounds very non tesco.. I bought the pink Himalayan salt from my local butcher! It is the same price as sea salt. The pink salt is the most unprocessed type you can buy preserving its mineral content so I like to use it. Regular sea salt is totally fine to use too.